We care about the families we feed. Use the Granny’s Whole Turkey Calculator below to estimate the size of Granny’s Turkey you will need, how long it will take to thaw, and how much time it will take to cook. Preheat oven to 350°F (175°C). Place the turkey, breast-side up, on a rack in a shallow roasting pan. Roast loosely covered with foil for one hour, then remove. If you choose to baste your turkey, limit the number of times you open and close the oven door (once per hour is sufficient). Turkey is fully cooked when a meat thermometer reads 170°F (77°C) for an unstuffed turkey, or 180°F (82°C) for a stuffed turkey, and the juices run clear. Gas: Roast the turkey in a shallow foil pan, on very low or indirect heat. The barbecue should remain covered during cooking. Maintain a barbecue temperature of 350°F - 375°F (180°C - 190°C). Add wood chips to a smoking pan to get more flavourful results. Turkey is fully cooked when a meat thermometer reads 170°F (77°C) for an unstuffed turkey, or 180°F (82°C) for a stuffed turkey, and the juices run clear. Charcoal: Build up hot coals around a drip pan placed in the centre of the barbecue’s bottom section. Place the turkey directly on the grill over the drip pan. Cover, open all vents and add more coals, as required, to maintain a barbecue temperature of 350°F - 375°F (180°C - 190°C). Turkey is fully cooked when a meat thermometer reads 170°F (77°C) for an unstuffed turkey, or 180°F (82°C) for a stuffed turkey, and the juices run clear. Once done, let your turkey rest for 20 minutes before carving. Wash hands, utensils and kitchen surfaces thoroughly to keep everything clean and bacteria free. Keep wrapped foods separate to avoid cross contamination. Do not let raw meat or juices touch ready-to-eat foods in the fridge or during preparation. Ensure chicken and turkey are cooked to proper temperatures. The juices should run clear when the meat is pierced with a fork. Refrigerate or freeze raw poultry as soon as you get home from the supermarket. Keeps the meat cold until completely defrosted. Place turkey on a tray on a bottom shelf in refrigerator. Allow 5 hours per pound (10 hours/kg). Put turkey in a large container or in the sink and cover completely with cold water. Change water at least every hour. Allow 1 hour per pound (2 hours/kg). Once thawed, refrigerate immediately, and cook within 48 hours. 2. Remove turkey from packaging. Remove the neck and giblets from the cavity. 3. Rinse bird and dry with paper towel. 4. Place turkey on a wire rack inside a roasting pan so that the juices are able to drain. Rub outside of the skin with olive oil and season with salt and pepper. 5. Cover the top of the bird loosely with foil and place in oven. Remove foil after 1-2 hours depending on size of bird. 6. Turkey is fully cooked and safe to eat when the meat thermometer reads 170°F (77°C) for an unstuffed turkey and 180°F (82°C) for a stuffed turkey. When done, remove turkey from the oven. Cover it loosely with foil and let stand 20 minutes before carving. *Times are approximate. Use a meat thermometer to gauge doneness. 2. Remove turkey pieces from packaging. 3. Place turkey on a baking sheet lined with parchment paper. Rub outside of the skin with olive oil and season with salt and pepper. *Use a meat thermometer to gauge doneness. 1. Direct method: The direct cooking method is similar to broiling. It means the food is cooked directly over the heat source. Use the direct cooking method when barbecuing turkey burgers, breast tenderloins, and cutlets. Method for Gas: Preheat the grill with all burners on high. Place the food on the cooking grate, and then adjust all burners to the temperature stated in the recipe. Close the lid of the grill, lifting only to turn food or to test for doneness. Method for Charcoal: Spread prepared coals evenly across the charcoal grate. Set the cooking grate over the coals and place food on the cooking grate. Place the lid on the grill and lift it only to turn food or to test for doneness. 2. Indirect method: The indirect cooking method is similar to roasting turkey in the oven. The heat rises, reflects and circulates around the food, so it cooks evenly like in a convection oven. Use the indirect method for barbecuing whole turkey, large pieces, drumsticks and sausages. Method for Gas: Preheat the grill with all burners on high. Adjust the burners on each side of the food to the temperature noted in the recipe. Turn off the burner(s) directly below the food. Method for Charcoal: Arrange hot coals evenly on either side of the grate. A drip pan placed in between the coals is recommended to collect drippings for gravy and prevent flare-ups. Keep the lid on the grill down, only lifting to baste or check for doneness. 2. Place the turkey in a shallow foil roasting pan and season with salt & pepper. 3. Place the pan on the grill on either very low heat or indirect heat. 4. The lid of the barbecue should remain down for the duration of cooking. Try to maintain a temperature of 350°F – 375°F (175°C - 190°C) throughout cooking. 5. 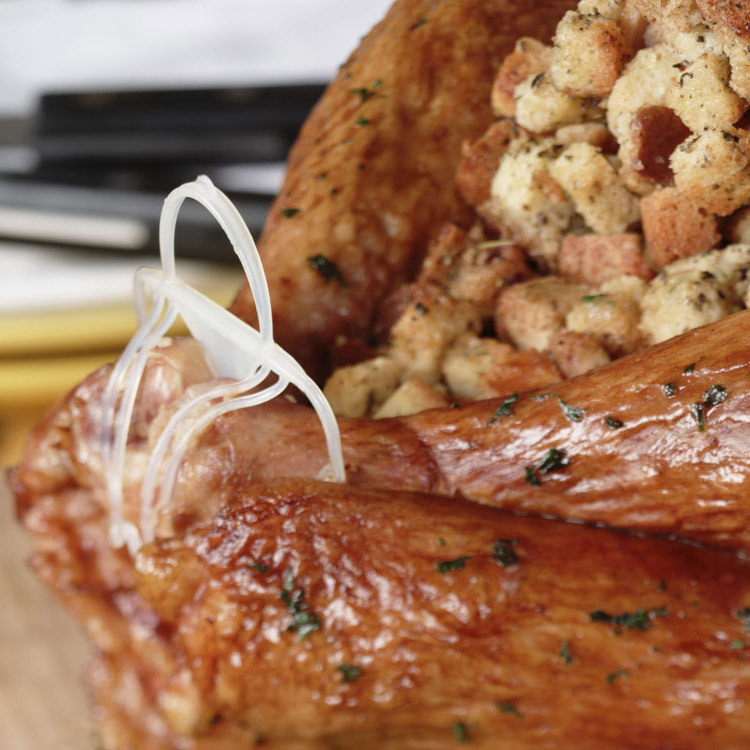 Turkey is fully cooked and safe to eat when the meat thermometer reads 170°F (77°C) for an unstuffed turkey. When done, remove turkey from the oven or barbecue. Cover it loosely with foil and let stand 20 minutes before carving. 1. Preheat barbecue. Build up hot coals around a drip pan placed in the centre of the barbecue’s bottom section. 2. Season the turkey with salt & pepper. 3. Place turkey directly on the grill above the drip pan. 4. The lid of the barbecue should remain closed and all vents should be opened. 6. Turkey is fully cooked and safe to eat when the meat thermometer reads 170°F (77°C) for an unstuffed turkey. When done, remove turkey from the oven or barbecue. Cover it loosely with foil and let stand 20 minutes before carving. Please note that we do not recommend barbecuing a stuffed turkey due to inconsistent cooking temperatures. It’s safer to prepare the stuffing on the side and barbecue in a separate dish. 2. Season turkey with salt & pepper. 3. Place the turkey directly on the grill on either very low heat or indirect heat. 5. Turkey is fully cooked and safe to eat when the meat thermometer reads 170°F (77°C). Place chicken on a tray on a bottom shelf in refrigerator. Put chicken in a large container or in the sink and cover completely with cold water. 2. Remove chicken from packaging. Remove any giblets from the cavity. 3. Place chicken on a wire rack inside a roasting pan so that the juices are able to drain. Rub outside of the skin with olive oil and season with salt and pepper. 2. Remove chicken from packaging. 3. Place chicken on a baking sheet lined with parchment paper. Rub outside of the skin with olive oil and season with salt and pepper. 1. Direct method: The direct cooking method is similar to broiling. It means the food is cooked directly over the heat source. Use the direct cooking method when barbecuing chicken burgers, breast tenderloins, and cutlets. 2. Indirect method: The indirect cooking method is similar to roasting chicken in the oven. The heat rises, reflects and circulates around the food, so it cooks evenly like in a convection oven. Use the indirect method for barbecuing whole chicken, large pieces, drumsticks and sausages. 2. Place the chicken in a shallow foil roasting pan and season with salt & pepper. 5. When done, remove chicken from the oven or barbecue. Cover it loosely with foil and let stand 20 minutes before carving. 2. Season the chicken with salt & pepper. 3. Place chicken directly on the grill above the drip pan. 6. When done, remove chicken from the oven or barbecue. Cover it loosely with foil and let stand 20 minutes before carving. 2. Season chicken with salt & pepper. 3. Place the chicken directly on the grill on either very low heat or indirect heat. 5. Chicken is fully cooked and safe to eat when the meat thermometer reads 170°F (77°C) When done, remove chicken from the oven or barbecue. 6. Chicken is fully cooked and safe to eat when the meat thermometer reads 170°F (77°C). 1. Season chicken with a little olive oil, salt and pepper. 2. Preheat skillet to medium. 3. Heat 1 tsp (5 ml) of olive oil in skillet. 4. Place chicken in skillet and flip as required. Learn the basics of cooking your poultry. Most of Granny’s whole turkeys come with the Handi Clamp attached to the drumsticks - similar to traditional trussing or tying a turkey’s legs with butcher twine. The clamp is made from heat-resistant plastic that is perfectly safe to leave on during cooking. It keeps the drumsticks close to the turkey and ensures even heat for cooking. To remove the Handi Clamp, unhook the tips of the drumsticks from the loops and pull the rest of the clamp out of the bird. If stuffing the turkey, remove the drumsticks from the loops of the clamp and then put them back in the loops once the stuffing is in place.